Casttoo: Chicks dig broken bones, right? 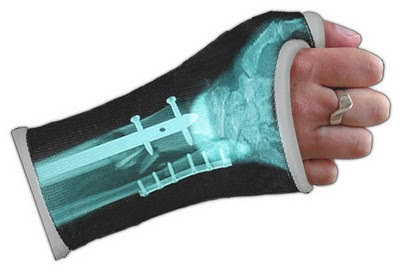 A fun one for Friday: Casttoo can help you explain your injury and maybe even garner some much-earned pity, all with an image applied to your cast. They offer all kinds of images, including the option to upload your own, but the most compelling has got to be an X-ray of your injury. It answers the inevitable questions while providing a unique sight to behold. Not unlike the previously-blogged Explanation Sling! ...this happens. 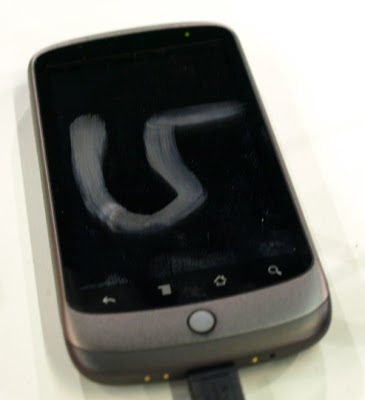 That's right, Android has a nifty feature where your phone can be password-protected with a gesture - swiping just the right pattern will unlock it. It's a very usable, clever idea - swiping is more natural and quicker than typing in a code, for example. As this photo from Will Park shows, however, you just need to be aware that the one time you unlock your phone with greasy fingers, your password gesture is out there for the world to see! Before I get to explaining the startling name of this product, a quick primer: most electronics run on direct current (DC) power, but homes are wired with alternating current (AC) power. 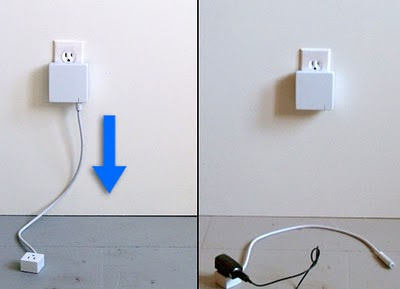 So almost every electronic device has an AC-to-DC adapter - a "power brick" or "wall wart," those little black boxes that plug into the wall sockets. The problem is that these adapters waste electricity, even when the electronic device isn't on. So, here we come to the "Leech Plug," a functional project by Conor Klein. As he explains, it mimics the behavior of a leech, which lets go of its host when it's full - and sure enough, this plug physically ejects its cord after a set amount of time! The engineer in me wants to say that he could just use a relay to completely disconnect the circuit instead of dramatically ejecting the cord - but the designer in me knows that this kind of visceral, abundantly clear technique will gain the fullest understanding of the user. Good one, Conor - you've given electric sockets a way to fight back! Please Rob Me - Usably cautionary...? Social media is a new phenomenon, so we're all kinda learning this stuff as we go along. But as Facebook, Twitter, Google Buzz, and all the others add new features, it's worth considering when things have gone too far - and with location-tagged status updates, a good case can be made that we're there! But how to shock the masses into this realization? Some snarky guys have the answer with their website Please Rob Me, which features real-time updates that unintentionally advertise unattended homes. The aim of the site, of course, is not to get these homes robbed, but instead to prod people enough that they'll think about their status updates. It's an interesting tactic - and usable, I'd say, in the sense that it's both visceral ("holy crap, I can't believe I just left myself open to that!") and viral (note its presence on this site). Not bad. And I'd like to remind all my readers: if I ever make a post suggesting I'm not at home, there's a good chance my pit bull is. Heh heh. The process of printing, filling out, signing, and sending (or scanning and emailing) documents is one of the last remaining justifications for the existence of fax machines - but since many people don't have'em anymore, we need respite from the aforementioned litany of chores. 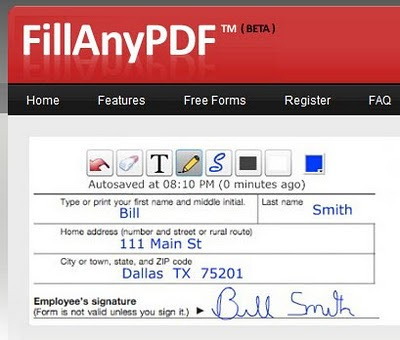 I already wrote about Zosh, an iPhone app that does the job - now there's FillAnyPDF, a free web-based solution. Looks like they got it right, not requiring any software download (it's web-based), lowering the barrier to adoption for this kind of process - and it's admirably green, saving all these things from being printed and physically shipped around. Kudos! iPad vs iPod Commentary - Which is which? 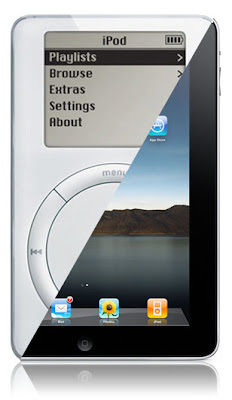 When Apple releases a new category of product, it generates a lot of commentary - but are things really all that different for the iPad than they were when the iPod was first released in 2001? FastCompany put together a collection of press quotes - hit the link, read each quote, and see if you can tell if it applies to the iPad or the original iPod. A lot of the similarity has to do with how people will use these products in their real lives - it was unknown for the iPod then, and it's unknown for the iPad now. But how people use it - and how Apple (and third parties) adapt to real usage patterns - will be a huge factor in determining its success. I'm eager to see what happens! Board Game Storage - as Framed Art! 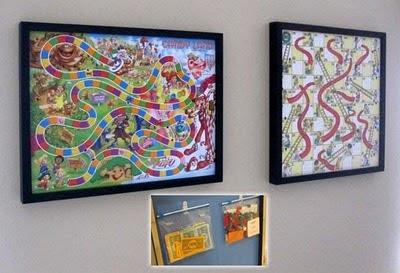 Here's a clever idea if you have lots of board games, not much storage space, plenty of wall space, and too much time on your hands: store your board games as framed wall art. Crafty blog Infarrantly Creative shows you how, and it involves some custom framing that's a bit beyond beginner-level, but it's still a pretty neat solution. Game pieces and other accessories can be stored behind the board in clip-on bags, and the game-selection process now feels like browsing an art gallery! Snazzy. As far as I can tell, ketchup to-go has been dispensed in those little rectangular plastic packets since the beginning of time. So kudos to Heinz for realizing that such ancient packaging could use a usability upgrade! 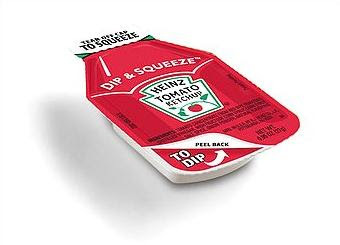 They've just announced the Dip & Squeeze pack, which bears more resemblance to dipping-sauce packages than old ketchup packs: a foil top peels off of a formed cup. The innovation here is that there are two ways to peel: off a corner to remove the top entirely for dipping, or tear off a front edge to squeeze the stuff out like before. That's a great option to have, especially in a situation where you want to dip your fries but dining space is limited. (It also reminds me of a design project I did back in college!) Finally, here's another change that's long overdue: this package contains three times as much ketchup as the old packets. It seems that serving sizes of fries have gotten bigger and bigger while ketchup packs have stayed the same - it's great that they've finally caught up! Branding Can Be Usable - Or Not! An old post on Khoi Vinh's blog Subtraction shows an abandoned change in Tropicana's branding, which apparently failed its brief trial because it was less usable for consumers. 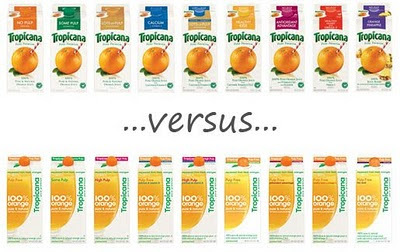 In the image here, the old branding is on top - it shows the various types of orange juice differentiated with a large block of solid color. So if you like Vitamin D medium-pulp, for example, you learn to look for the purple box. However, the failed branding shown at bottom relegates the variety indicator to a teeny tiny line of text - so that all the boxes look the same unless you put a lot of effort into scouring the details. Designers of the modern "clean & spare" aesthetic may prefer simple sameness - but consumers need usability! This one's a victory for the good guys.